Happy Friday. Typically my posts are pretty topical, but I am going to be a bit all over the place today. It’s a bit how my brain is functioning these days. 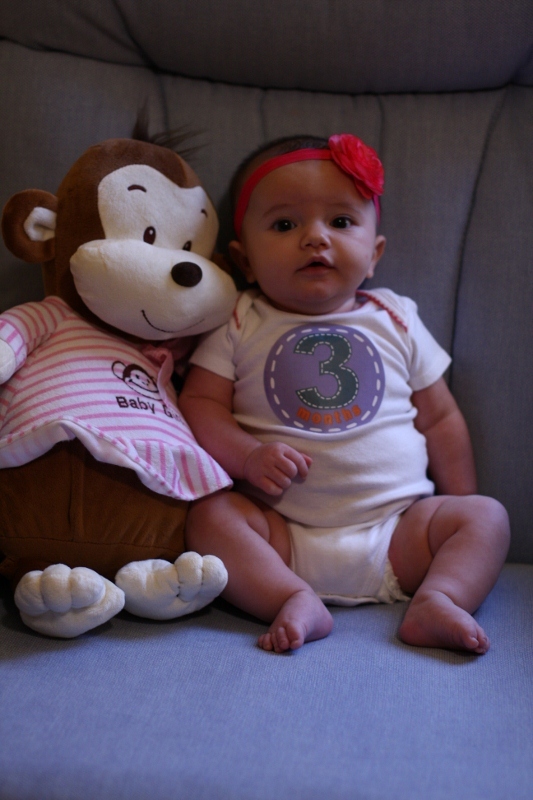 Adeline is 3 months old today. We continue to marvel at how big she is getting! She is holding her head up really well, cooing, smiling and sleeping 6-8 hours stretches at night. She loves, loves, loves to nurse, which accounts for those delicious, roly, poly thighs. (3 month sticker by Sticky Bellies). I was anticipating that this weekend Adeline and I would be traveling to Iowa for Sara’s funeral, but God has other plans for when He is going to bring her home. She is still with us, hearing words of love that her family continues to whisper into her ears. So instead of traveling, I am going to make Adeline’s Halloween costume tomorrow. She is going to be an owl. I am going to combine a few ideas I have seen on Pinterest. (See my Halloween board here). I’m really excited about it. I’ll be sure to post pictures when its done. Elias is going to be Buzz Lightyear for Halloween. I found his costume last year on Craigslist. The original owner paid like $70 for it at Disney World and it lights up and is totally rad. I paid $20. Elias is obsessed. He wants to wear it every day. Check out this video he made of himself (and Daddy edited). On Sunday, Adeline is getting dedicated at church. She is going to wear the baptism gown that my mom, her brothers, my sister, all my cousins and I wore. (I thought it was far too girly for Elias to wear…). It makes my heart happy to carry on this tradition. This weekend I am also hoping to put a dent in my 2009 photo book. (I completed 2010 and will feature it during next month’s memory keeping series). I have a Groupon that expires next month, so I really need to get going. I have been using Picaboo for these books, which I have been happy with. If you have any photo books to make, check out Eversave today. They have $25 for $75 worth of Picaboo products, and you get a $3 credit when you join, making it just $22. You can also use this on photo calendars and cards- perfect for Christmas! And, in case you missed my post of Facebook, Totsy has Stride Rite shows for 50-60% off right now. Stride Rites are our favorite kids shoes and I have never seen them this cheap. I bought a pair for Adeline for next year when she starts to walk. If you haven’t ordered from Totsy before, you get free shipping. They also have some really cute clothes for kids and mom right now. I bought Elias some pjs. Join here. Lastly, mama needs cute shoes too. There are some adorable sweater and fuzzy ugg look alike boots on Haute Look today. I snatched a pair up for me. So jealous of the great deal on the Buzz costume because my 5 year old is wearing the same costume this year and I will not even say what we payed for it at the Disney store! We always sell them after the holidays to try and get some of the money back! oh my word, I was literally LOL’ing at Elias here at my desk – too cute for words! I have to say every time I see a photo of precious Adeline my mind forever will go to the image of her tucked into Sara’s arms. Baptisms are so joyous and what a wonderful generational gift of the gown to be worn. That string cheese messed with the wrong space ranger. Adorable kids, Jessica. What a fun season of life. I’m praying for Sara and you and the many who watch in holy wonder. What a beautiful soul. Grace and peace to your grieving, grateful heart. thank you, Jess for your words. I am just a lurker mostly. I love love love the pics of Adeline. My grandmothers name was Sarah Adeline. Beautiful huh? I am praying for you. Praying that God will give you His strength and peace. You are blessed. What a beautiful family… I feel that I know you somewhat as I watched the bloom book club videos with you and Angie and Ann… and all of them. Praying for Sara too… God has used her mightly ….. she has spoken life into mine. In the hard places…..
Sure do love your blog, Jessica! I’m so sorry about your friend Sara – what a beautiful young woman she is, and how sad you must be. I love all the “deals” you post for us all to take advantage of! I’ve ordered 2 free Shutterfly photo books and am waiting until another deal comes up to make my 3rd (Christmas gifts for my 3 sons 🙂 I also ordered 2 journals from Coterie and they are beautiful! Thank you!!! I love your positive and loving spirit and look forward to your posts! Have a good weekend. Adeline is beautiful! They grow too fast, don’t they? I am praying our sweet Sara home. I will be thinking of you and all who love her in the coming days. So neat to see how fast little ones grow. You sometimes miss it when your living it. It’s great that you’re capturing these moments. 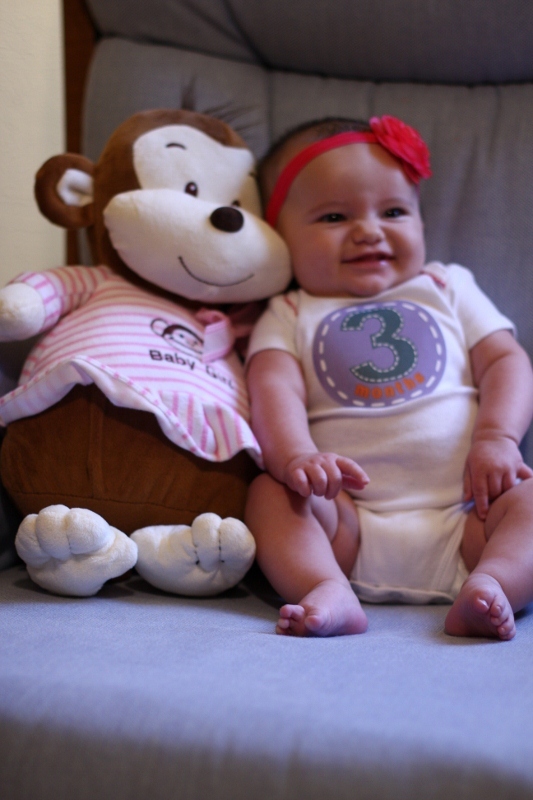 Love those 1,2 and 3 month pics. Great idea! You’ve got a beauty to photograph. Just precious….and I love her name!